Ever visualized getting a ride just one tap away? Earlier, people were used to traveling by waving the arm waiting for a taxi. That was the former century tactic. In place of that now, an app does all the work. There are lots of top taxi booking app development companies who have developed Cab Management Software with stunning features to make a ride easier and faster than before all across the Globe. People are using these services at a more rapid pace than ever before! Uber taxi app is the top and one of the first taxi app companies in the world. Uber has become very popular across the world There are many taxi app companies who build apps like Uber model taxi app. 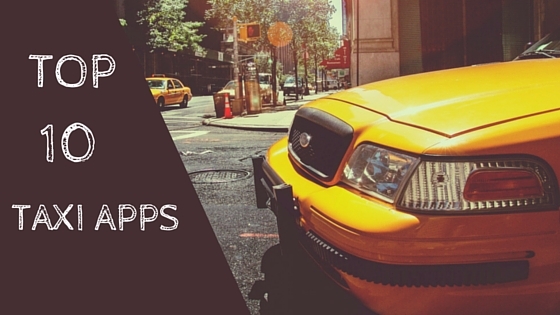 Here is the list of top 10 taxi apps from around the world. Let’s start with the Uber itself. Uber is one of the best and fast-growing apps that has covered the highest number of cities and countries in the world. According to the latest count, Uber serves its service in 67 countries and 78 cities across Asia-Pacific. Uber essentially offers very economy UberX across Asia depending on where you live or where you’re traveling. Some smaller cities have even more cheap UberGo, using small cars. Some of the cities have UberBlack, UberSUV, UberXL as added choices at higher costs. According to the recent options risen up, such as People’s Uber in China, which is like UberX except that Uber doesn’t make any profit from it. Striking features: Android, iOS, and Windows Application, Currently, Uber accepts cash payments from passengers all across India, as well as in selected cities in Indonesia and the Philippines. Lyft is a US-based taxi dispatch app development with more than 60 cities across all of the United States and is one of the best Apps to make ride-hailing easier, safer and trustworthy. It approves the drivers having a valid driver’s license and checks DMV, and Background. While considering the interface of the apps they hold a stunning interface, which allows users to track their ride and the driver details. According to the research, published in the Zebra Magazine observed that the average waiting time on Lyft is a minuscule 6 seconds. It also provides three alternatives – Lyft, Lyft Plus, and Lyft Line, with which users can ride alone or in a group of six members. Striking Features: Covered over 60 cities within the United States, provision for six people to share a ride with Lyft Plus, Android and iOS mobile applications available, Excellent response time and better safety. Hailo is one of the fastest growing ride-hailing services in the UK, launched in November 2011. A Hailo app is trusted throughout the world. It is available in more than 20 cities, including London, Madrid, Barcelona and Osaka, and all across Ireland. Most noteworthy, Hailo Hub has added a new feature that allows users to book a cab on behalf of others. Using that feature, you can easily book a cab for your guest. Recently, Hailo introduced its new feature-electronic pay, that enables users to pay the cab fare from the app right away. Hailo also offers to ride business class for premium users. Hailo is now available in Singapore for metered taxis. Hailo has made booking a cab easy and fasts with CRB checked drivers. Striking Features: CRB checked drivers, Hailo Hub, Hailo electronic pay, Hailo for Business, Android, Apple Watch, and iOS mobile applications to easily book a cab. Countries Available: United Kingdom (4 cities), Ireland, Spain (2 cities), Singapore, Japan. Ola, one of the fast-expanding, now covers over 100 cities across India. It offers an order of vehicle types: small cars, metered cabs, standard sedans. Additionally, there’s Ola Auto for hailing tuk-tuks. Ola provides the fastest way to book a cab from anywhere in the city, right on your smartphone. Ola Cabs is one of the biggest ride-hailing apps. Ola bought TaxiForSure, one of the other prominent ride-hailing services in India. They offer economical fare prices amongst the several ride-hailing services currently running in India. Since Ola provides verified drivers and cleanliness, safety and comfort trip, Ola Cabs’ riders are very satisfied with the services they get. Ola Cabs’ prompt confirmation of the booked to ride and the app interface that indicates the location of the ride, Ola Cabs has become one of the most extensively used ride-hailing apps in India. Striking Features: Over 100 cities supported in India, verified drivers, Android, iOS and Windows mobile applications. Ola accepts both cash and cashless payments. Grab Taxi is based in Southeast Asia. With over 75,000 drivers registered on the network, GrabTaxi has one among the biggest fleets of ride-hailing vehicles. GrabTaxi has been authoritatively reviewed by people across the Southeast with over 3.8 million mobile application downloads. It is undoubtedly reviewed for its comforts and safety. This is the to-go taxi-hailing services if you are looking to book a trip and located at one of the locations mentioned below, Grab Taxi is the best option for comfort and secure ride. GrabTaxi is available in 21 different cities across 6 different countries in Southeast Asia. Being named the Frost & Sullivan Best Travel App of 2013, GrabTaxi contributes to the best taxi-hailing experience. Striking Features: Pre-screening of drivers, Track your ride, Android, iOS and Blackberry mobile applications. Countries Available in: Malaysia, Singapore, Thailand, Vietnam, Indonesia, and the Philippines. Didi Dache was established by the merger of China’s top two ride apps. The resultant company has the support of web giants Alibaba and Tencent. Didi Dache is one of the most leading taxi app used in China covering more than 300 cities. It is available only in Chinese. One of the greatest features of Didi Dache is that it is also accessible from within WeChat, the famous messaging app created by Tencent. It also has its own apps for iOS and Android. Striking Features: Taxi hailing, Hitch, Express, Personal car service, ride tracking, driver rating, Android and iOS applications, and much more. Gett is also a US-based Taxi app. It was previously known as Getting Taxi, one of the fastest growing cab-hailing services in the United States. Recently Gett has decreased its pricing by 25% on rides booked in NYC. Operating internationally in cities like London, Moscow, Tel Aviv, NYC was the first place of operations of Gett in the United States. With an estimated arrival time and driver information made available once booked, TLC licensed and tested drivers, and cashless payment, Gett is all perfect about ride-hailing. Gett has increased $520 million in venture funding to date, and was selected by Forbes as one of the “top 15 explosively growing companies”. Striking Features: Book in advance up to 2 weeks, no price surges, $10 rides anywhere below 110th St in Manhattan, Android and iOS applications and much more. Countries Available: United States, United Kingdom, Israel and Russia (More than 60 Cities). LeCab is France-based taxi service established in 2012. It serves in Paris that is one of the most beautiful cities in the world. LeCab has built its reputation for unsurpassed service in Paris. It is fast growing as the best ride-hailing app with over 70,000 active users and an increasing number of vehicle fleet in France. LeCab makes use of the standard Peugeot 508, Made In France vehicles as their fleet of cabs to transport customers across the city. Re-booking your ride in one click, shake your smartphone to reset the details and a ton of other cool mobile application features make LeCab a viable taxi riding in France. Striking Features: LeCab Fly, Fixed price rides, ride guaranteed in 7 minutes, Android, Windows, and iOS mobile applications. Countries Available in France (Paris). Cabify is one of the prominent taxi booking app development companies in the world, is just two clicks away from the users. It allows users to book a ride immediately by using their Android or iOS applications. Cabify features a fixed and transparent rate system, which ensures that users are not price gauged. Cabify facilitates people to book their business and formal trips in advance. Corporate traveling provides with the invoices, an account manager, lower rates, multiple account support, and many other such great features. Furthermore, it also provides facility users to book a cab for someone else. following features make Cabify one of the best alternatives in many cities across the globe. Striking Features: Cabify for Business, Fixed rates, No hidden charges, invoices, account manager, multiple account support, a wide choice of payment methods, a book for someone else, and more. Countries Available: Spain, Chile, Peru, Mexico, Columbia. BiTaksi is one of the most popular taxi-hailing application in Istanbul with over 34,000 taxi drivers and over 200,000 registered users. This is one of the few taxi-hailing services to have introduced in-app credit card payment system. Bitaksi brings cashless payment to Istanbul. It also provides other key details in-app like the current traffic on the route, to improve efficiency and service reliability. Striking Features: Fastest growing taxi-hailing service in Istanbul, cashless payment, traffic information, licensed drivers, driver ratings and much more. All the above taxi app companies create Uber Clone Taxi App yet unique and they all are popular in different countries and cities where they serve their services. Day by day increasing use of the taxi app indicates that the ride-hailing app gives flexibility and power in the customer’s hands and made a Taxi cab booking very easy and fast.